The DIL/NetPC PNP/5280 provides a very compact ColdFire-based low power embedded controller (Motorola/Freescale 32-bit MCF528x) with full-featured TCP/IP stack and web server for high-speed embedded networking applications. The PNP/5280 offers the footprint of a standard 169-pin PGA socket (Socket 3) with 2.54mm centers and all the hardware and software features necessary to add high-speed networking capabilities to any product design. The PNP/5280 is developed specifically for products that need to be connected to 10 or 100 Mbps Ethernet-based TCP/IP networks with minimum development costs. 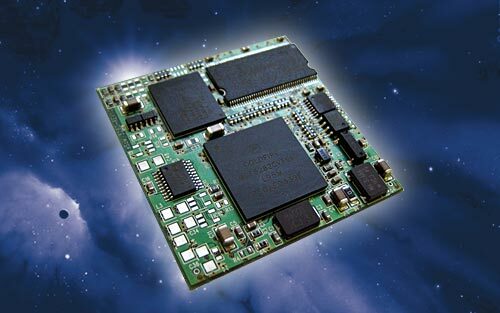 The PNP/5280 is a ready-to-run full programmable 32-bit embedded networking system. The use of the PNP/5280 will allow you to realize substantial time and costs savings over other chip-based approaches. Currently, there is no other 10/100 Mbps Ethernet- and full-featured TCP/IP-based embedded networking solution with more development time savings on the market. There is also no faster Time-to-Market for your product with lower costs if 32-bit-based 10/100 Mbps Ethernet, full TCP/IP and an embedded Web server or other TCP/IP-based server software is required. To interface the PNP/5280 with existing devices and equipment, the PNP/5280 offers two asynchronous serial RS232C interfaces with TTL levels, one I2C interchip bus interface, one queued SPI (Serial Peripheral Interface), one CAN interface with support for the CAN protocol specification 2.0B, 18-bit general purpose high-speed parallel I/Os and a 32-bit extension bus with interrupt input and chip select outputs. There are two ways for the PNP/5280 system integration: 1. Adapt the PNP/5280 to your existing product. Use the existing I/Os within your product to communicate with the PNP/5280. 2. Use the PNP/5280 to control and monitor the hardware of your existing product. This might enable you to replace your existing controller entirely. In a new product design, the PNP/5280 can be the main controller. Additional I/Os are driven by the 32-bit extension bus. The on-board FLASH memory provides storage for the PNP/5280 operating system with a full-featured TCP/IP stack and embedded web server as well as OEM applications and data. The FLASH memory is in-system programmable over Motorola BDM, serial and the Ethernet interface. The boot block of the FLASH memory is only in-system programmable over the Motorola BDM interface through a special adapter cable attached to a PC parallel port. For all other FLASH blocks, you can use also a high-speed serial connection through the PNP/5280 COM1 port or the 10/100 Mbps Ethernet interface for in-system programming. The PNP/5280 in-system programming was developed for OEM application software, operating system downloads and data download and to make it easier to update the on-board FLASH content in the field.